Belatedly following up his seminal 1974 original, Tobe Hooper completed the third of his three-picture deal with Cannon Films in 1986 by delivering a (very) 80’s sequel. Eschewing the gritty grind house aesthetic of the original, The Texas Chainsaw Massacre 2 is very much a glossier product of it time, with yuppie Reagan-era politics now being satirised, a distinctly generic-sounding electronic horror-film soundtrack replacing the disconcerting farmyard cacophonic soundscape of TCM, and a generous ladleful of 80’s gore effects from Tom Savini. Understandably, no other director was willing to take on the unenviable task of helming a sequel to Tobe Hooper’s classic, so producer Hooper eventually took up the directorial reins himself. Sagely realising that he couldn’t capture lightning in a bottle twice, Hooper turned up the humour dial to ‘11’, and (miraculously, given the shooting deadline) delivered to Cannon Film’s Menahem Golan and Yoram Globus a film that censors both in the US and the UK collectively failed to appreciate the dark humour amidst the gore. Faced with an ‘X’ rating, Cannon released the film unrated (commendably intact for sure, but thereby hampered with both promotion and theatrical distribution). In the UK, the film never made it to initial release after the BBFC procrastinated over it for so long the distributor gave up the ghost. (It was eventually passed uncut on home video in July 2001!) Therefore, myself and fellow UK gore hounds had to resort to inferior 2nd generation video versions transposed from NTSC copies whose wobbly tracking and diluted colour palette didn’t help one’s appreciation of the film one little bit. Bill Moseley’s deliciously grotesque Vietnam vet Chop-Top (the brother of the original hitchhiker ‘Nubbins’) constantly ‘hot-wiring’ his skull along a fissure in his metal head plate with the heated end of a coat hanger - whilst spitting out eminently quotable sound bites such as ‘Dog will hunt!” - is so memorable he often threatens to upstage Leatherface himself. Largely essayed by stuntman Bob Elmore after Bill Johnson struggled to convincingly wield the chainsaw, Leatherface is no longer a squealing lipstick/apron adorned maternal distortion, but sporting a newly stitched Tom Savini skin mask, he develops a sickly comical ‘beauty and the beast’ attraction toward plucky DJ ‘Stretch’ (Caroline Williams, so striking in her ultra-short denim hot pants). His courting methods however leave a lot to be desired, firstly (in an obviously censor-baiting move) phallically caressing her splayed inner thighs with his chainsaw (impotently, but thankfully unable to start the saw as it approaches her crotch), and later, ‘romantically’ presenting her with the freshly skinned face of her radio station soundman as if it was a corsage for a high school prom date! Dennis Hopper’s bizarre turn as ‘Lefty’ culminates in a chainsaw duel atop the Sawyer’s dinner table which gives Tom Savini an opportunity to pull off another of his gory magic tricks following on from head-slicing and skinning mayhem. 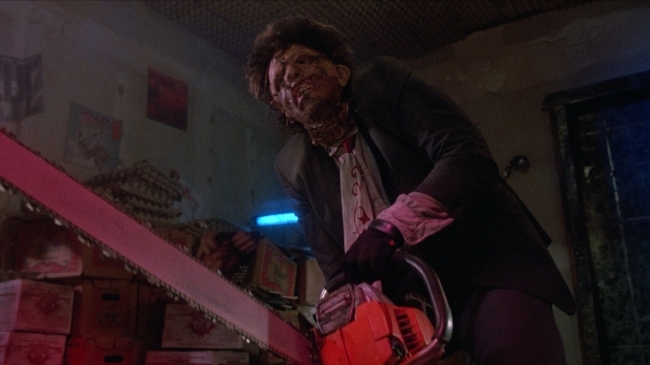 (There was also a sequence in an underground car park, cut by Hooper himself for pacing, which presented further opportunities for Leatherface to connect saw to flesh and bone and to demonstrate Savini’s penchant for inventive slaughter. This outtake is included in the extras, albeit in low-res VHS quality). 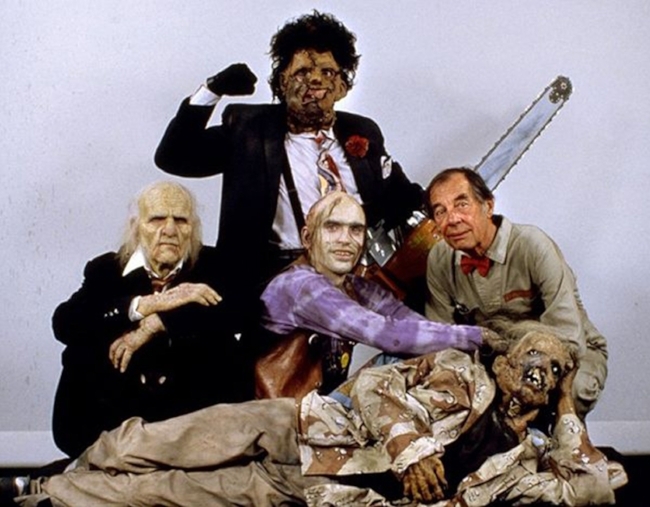 Part of the initial resistance to The Texas Chainsaw Massacre 2 was the absence of the original Leatherface (Gunnar Hansen) and the obvious transition to upfront humour and social satire at the expense of the unrelenting visceral terrorisation of its predecessor. But time has been kind to The Texas Chainsaw Massacre 2, and thanks to Arrow’s glorious Blu-ray, it’s a whole lot easier to appreciate Hooper’s vision for his sequel, and to, perhaps belatedly, feel the buzz.